7:56pm: Scherzer’s $50MM signing bonus is broken down by Fangraphs’ Kiley McDaniel, who reports that Scherzer will receive $5MM of the bonus in 2015 as paid out in twice-monthly in-season installments. A similar structure will result in Scherzer getting the rest of his bonus, with the righty being paid $15MM in 2019, $15MM in 2020 and $15MM in 2021. 5:25pm: Scherzer will earn $10MM in 2015 and $15MM in each of 2016, 2017 and 2018, ESPN’s Jayson Stark reports in a breakdown of the contract. The deferred payments begin after the 2018 season, as while Scherzer is scheduled to earn $35MM in each of the 2019, 2020 and 2021 seasons, all of that money will be paid to him through 2028. JAN. 22, 12:33pm: Scherzer’s contract does not have a no-trade clause, reports Jon Heyman of CBS Sports (Twitter links). The Nationals feel that the deferrals and 14-year payment structure of the contract serve as de facto no-trade protection, and as Heyman points out, Scherzer will receive 10-and-5 rights after the 2019 season. Additionally, Scherzer’s deal calls for a $500K bonus for each Cy Young Award he wins. He’ll receive $250K for finishing second, $150K for finishing third, $100K for finishing fourth and $75K for finishing fifth. JAN. 21: The Nationals have officially agreed to sign the market’s top starting pitcher to join a rotation that already ranked among the league’s best. Ace right-hander Max Scherzer will come to D.C. for a seven-year term that will run through his age-36 season. Scherzer will earn $210MM for seven years of work, but will receive that payout over twice that duration. The contract’s unusual structure has a significant impact on its value. Scherzer will receive $15MM per season for the next 14 years, meaning the Nationals will be paying Scherzer through 2028. Scherzer’s deferral is, obviously, the largest one in MLB contract history, leaving Bobby Bonilla and the Mets’ lengthy $29.8MM deferral in the dust. The deal’s structure does, however, also protect Scherzer by including a $50MM signing bonus that will be paid in even installments over the 14-year term. In concert with Washington, DC’s lack of non-resident income tax and Scherzer’s planned move to Florida, he figures to reap tens of millions of dollars in tax savings. Needless to say, it is all but impossible to arrive at a precise valuation of the contract, both to team and player. The Nats’ emergence as a top bidder for Scherzer came as somewhat of a surprise, given the terrific starting pitching they already had (including Stephen Strasburg, Jordan Zimmermann, Gio Gonzalez and Doug Fister, with the signing bumping Tanner Roark, who himself had a very good 2014 season, out of the rotation). But signing Scherzer should help the Nationals continue to contend in a weak NL East division beyond next winter, when Zimmermann, Fister, Ian Desmond and Denard Span all can become eligible for free agency. The Scherzer deal also gives the Nationals the option to trade someone like Zimmermann or Fister within the next few months, potentially getting good value for one of their free-agents-to-be while maintaining a formidable rotation. A trade involving Strasburg, who is eligible for free agency following the 2016 season, could also be a possibility. (One also wonders whether Roark, with his lengthy and affordable control rights, might also be had.) The Washington Post’s Barry Svrluga tweets, though, that the Nationals won’t necessarily have to trade anyone to make room for Scherzer. Though MLBTR’s Tim Dierkes rated Scherzer the top available free agent this winter, actual news about Scherzer had been slow in coming before this weekend. He and another top starting pitcher, James Shields, lingered on the market long after everyone else in the top ten had signed. Boras and Scherzer had reportedly been seeking a $200MM contract after rejecting a $144MM extension offer from the Tigers last spring. Seven years is, of course, a very long time in a pitcher’s career. Via MLBTR’s Transaction Tracker, only four pitchers in recent history have received seven-year deals. Two of those were relatively recent extensions for Clayton Kershaw and Felix Hernandez. C.C. Sabathia’s seven-year deal worked out well for the first few seasons, but Sabathia has struggled with injury and diminished velocity in the last two years. A fourth seven-year deal, the Giants’ pact with Barry Zito, was a bust, although Zito, unlike Scherzer, showed signs of decline even before signing his contract. Depending upon how one values the deal (see above), Scherzer’s contract would exceed Hernandez’s $175MM contract and would also top Justin Verlander’s 2013 extension with the Tigers, which tacked five years and $140MM onto Verlander’s existing deal to total seven years and $180MM. Nationals GM Mike Rizzo drafted Scherzer in the first round in 2006 while Rizzo was vice president of scouting for the Diamondbacks. 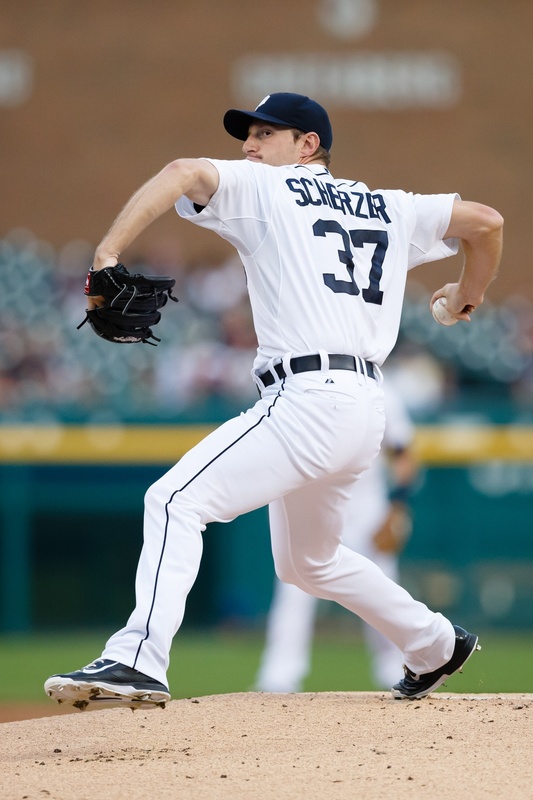 Scherzer quickly emerged as a solid starting pitcher, making the Majors less than two years after being drafted and one year after signing. After two seasons in Arizona, he headed to Detroit and developed into an ace, posting three good seasons in his mid-20s before winning his first Cy Young award in 2013. He had a strong repeat season in 2014, throwing 220 1/3 innings with a 3.15 ERA, 10.3 K/9 and 2.6 BB/9. Even without Scherzer, the Nationals already appeared to be easily the best team in the NL East — they won the division by 17 games last year, and the only other team in the division that has decisively improved its roster for 2015 is the Marlins. The Nationals’ acquisition of Scherzer strengthens their already-strong status as NL East favorites. Scherzer’s departure leaves the win-now Tigers without their top starting pitcher, although they still have David Price, Anibal Sanchez, Verlander, and the newly acquired Alfredo Simon and Shane Greene. Price and Simon are eligible for free agency next winter. Scherzer rejected the Tigers’ qualifying offer earlier this offseason, so the Nationals will sacrifice their first-round pick of this year’s draft, No. 27 overall, as a result of the signing. The Tigers will acquire the No. 35 pick. CBS Sports’ Jon Heyman tweeted that the deal was agreed to after being first to report that the Nationals and another team were in talks for Scherzer. The Washington Post’s Adam Kilgore later tweeted that the sides were close to a deal. Tyler Kepner of the New York Times (via Twitter), Ken Rosenthal of FOX Sports (in a tweet), Yahoo! Sports’ Jeff Passan (likewise), and Heyman reported details of the contract deferral.